We’re about to witness perhaps a ‘one of a kind’ in Maltese film-making with the arrival on screen of ‘Kont Diġa’ (‘I was, already’), a full-feature Maltese film with Maltese film-makers and a near totally Maltese cast. The film, shot in Maltese but showing with subtitles for non-Maltese speakers, premieres at St James Cavalier, 2 October. The islands have long been recognised as a useful place to shoot films. Malta has seen the making of many international greats, and for good reason as it has excellent facilities. The Mediterranean Film Studios is renowned for its SFX water tank facilities, and Malta’s historic landmarks have served as locations for all manner of films from Midnight Express (1978) to Gladiator (2000) and the Da Vinci Code (2006). Now, Malta is seeing its own film industry burgeoning, with Kont Diġa taking Malta down another avenue in its love affair with all things film. Director, Mark Dingli explains where Kont Diġa fits in the story of Maltese film-making: “This film is more comparable to older Maltese features than recent ones. Maybe what’s unique to it is that it’s not completely art house, neither is it a commercial popcorn flick. It has a clear narrative story, simple but present unlike the descriptive only nature of some early Maltese films. It’s easy to follow and everyone can relate to it in some way or another. But it’s definitely not a commercial film. The film’s storyline is one many returned Maltese migrants will no doubt associate with: it’s about a young free-spirited artist, Karl, who returns to his home island Malta after a long time away. It covers his personal journey discovering his roots. Reliving old habits with friends and memories from his childhood, this journey leads him to re-visit his past with his ex-girlfriend, and then with a new friend, Anna, through whom he visits his old home in Gozo, now a neglected house full of memories. Anna is his springboard for self reflection and becomes his reason for trying to start life again in Malta; a place he’s familiar with but is now seeing through different eyes. 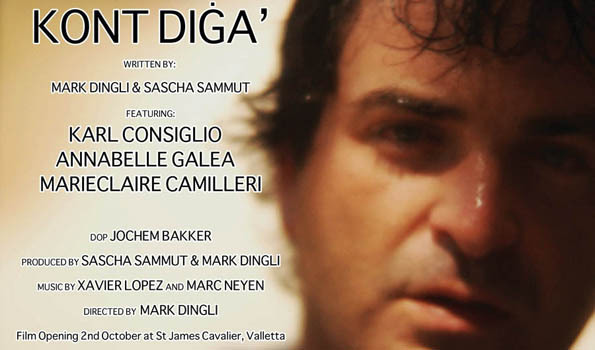 ‘Kont Diġa’ was directed by Mark Dingli and produced by Sascha Sammut using their own original screenplay. The film was independently funded and produced. It was made possible through international collaboration with young film-makers from the Netherlands, where Mark Dingli studied film for many years. The original soundtrack was written by Xavier Lopez from France and Marc Neyen from Germany. The film uses a nearly all-Maltese cast, with Karl Consiglio, Annabelle Galea and Marie Claire Camilleri taking the lead parts. Kont Diġa was filmed in Malta last summer is now to premiere locally at St James Cavalier, 2 October, with further screenings on 3, 4, 7, 8, 11, 14, 15, 16 and 18 October. For more information, see www.kontdiga.com. For booking contact St James Cavalier on +356 21232166 or send an email on info@sjcav.org. Im a Mcast student studying Media Moving Image at Higher National Diploma. Currently we are working on an assignment about script writhing and from where do feature film get their funds. Would you please kindly tell me from where you got your funds and was it easy to maintain the budget you worked for?